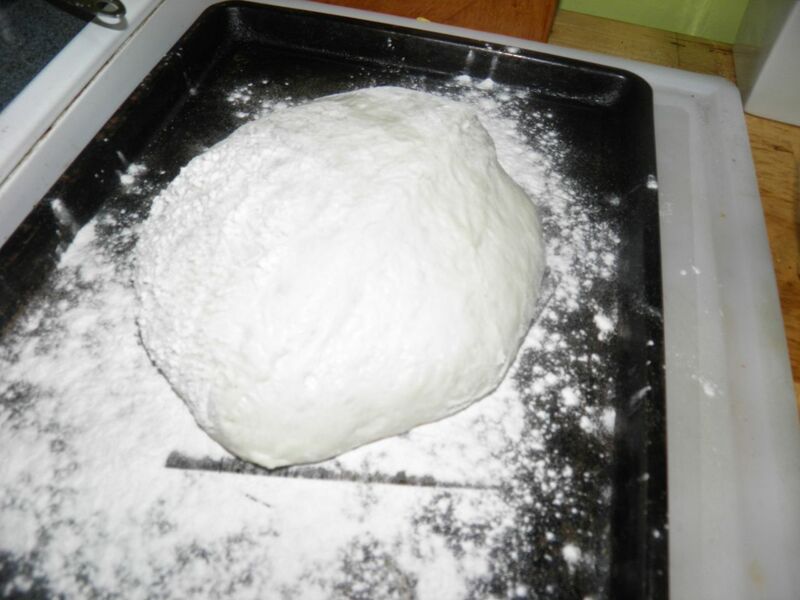 Fresh Italian ciabatta in 4-5 hours? Yes. So you have no excuse for not having really good bread for dinner this evening – even if you start it at noon. Step one. All ingredients combined. My recipe is based on one originally posted on usenet in alt.bread.recipes by Jason Molina, and reposted (in homage I believe) onto The Fresh Loaf. If you’ve never been to thefreshloaf.com go now. Actually finish reading my post and then go. 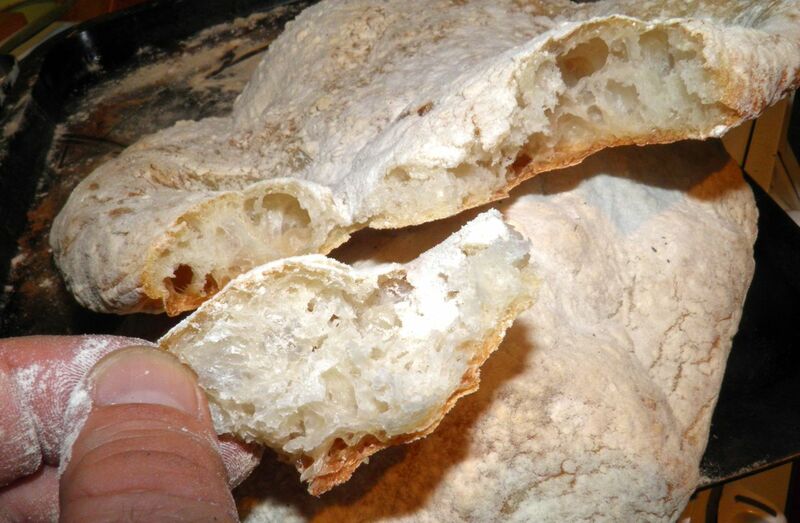 It’s a must see – an amazing, amazing site if you’re interested in bread at all. You don’t have to pre-proof yeast for this so to be safe use new yeast. 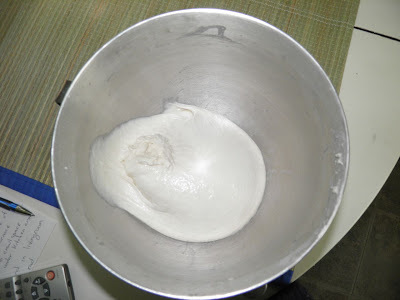 It also relies on a mixer with a dough hook to knead it. There’s no way you could with your hands. It’s too wet a dough. 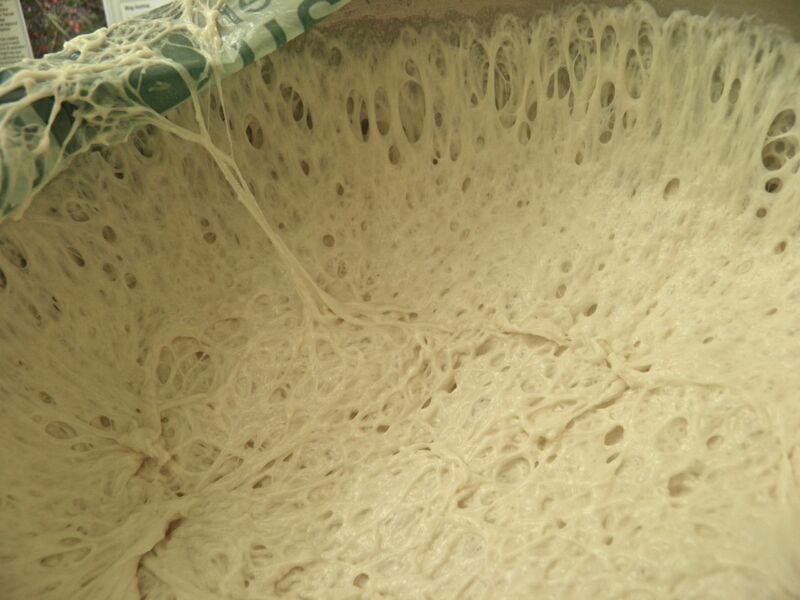 The 15 minutes kneading with the machine is what is responsible for all the beautiful holes in the bread. This is really good although I had hills and valleys in the final loaves. That was my fault, not the recipe. I made my loaves too wide and flat. The directions in the recipe have been corrected. 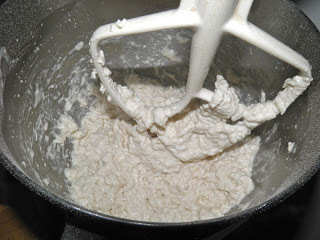 Step 2: kneading with a dough hook. My shaping skills will get better as I make more of this – and I will. It is slightly sweet and moist inside with a firm crust. It was wonderful dipped in balsamic and oil. 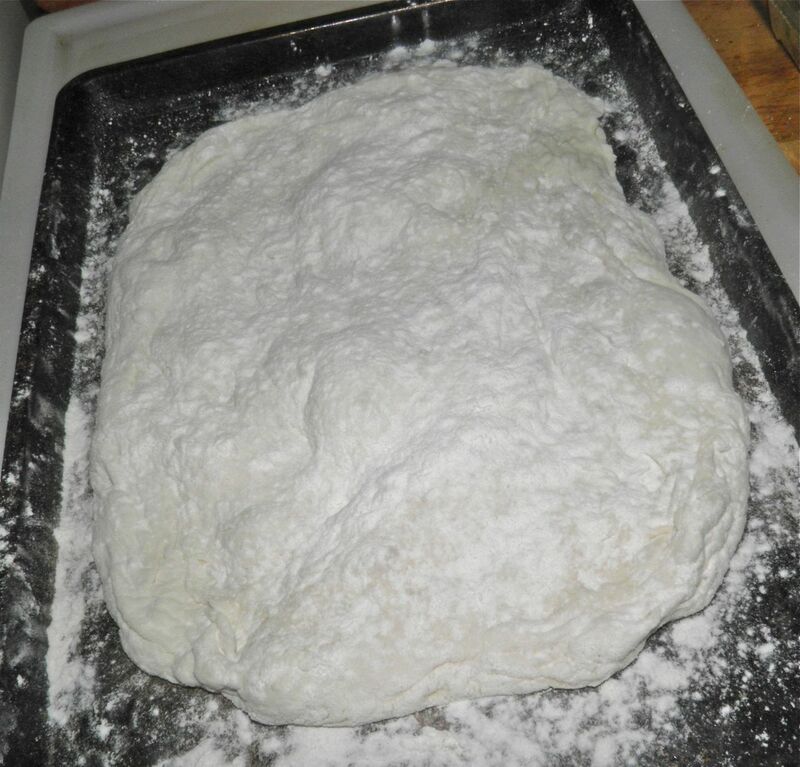 This recipe is only a fraction of the work of a normal ciabatta recipe, as far as shaping goes. 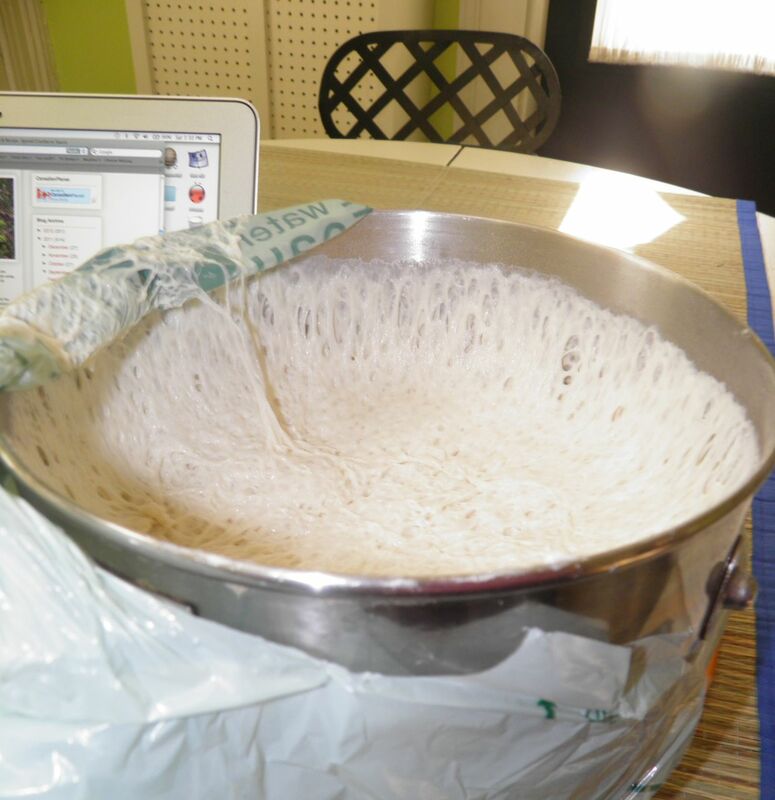 It does not use the traditional stretch/fold method for forming the loaves. You couldn’t because the dough is so wet. The only shaping happens just before baking. One of the most common uses for ciabatta bread is for the pressed, grilled Italian sandwich called panini. This bread works well for pressed sandwiches because its texture can hold up to being pressed without becoming soggy or falling apart. Another common use is for antipasti. The bread is dipped into olive oil mixed with chopped herbs or balsamic vinegar. This recipe can easily be doubled, but you'll need a big bowl to let it rise. This is the resulting dough after kneading. This is what the dough will look like after rising. Close-up. It looks more like a bowl of biga starter than bread. 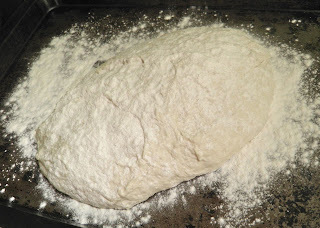 Half of the dough, resting for 45 minutes. Get out your KitchenAid mixer. Beat all the ingredients together with the paddle attachment. Let the dough rest for 10 minutes, then knead on medium speed for 15 minutes with a dough hook. Cover the dough with plastic wrap nd a tea towel. Let rise until tripled in a warm place(about 2-3 hours). In summer the best place is outside. Flour a work surface liberally. 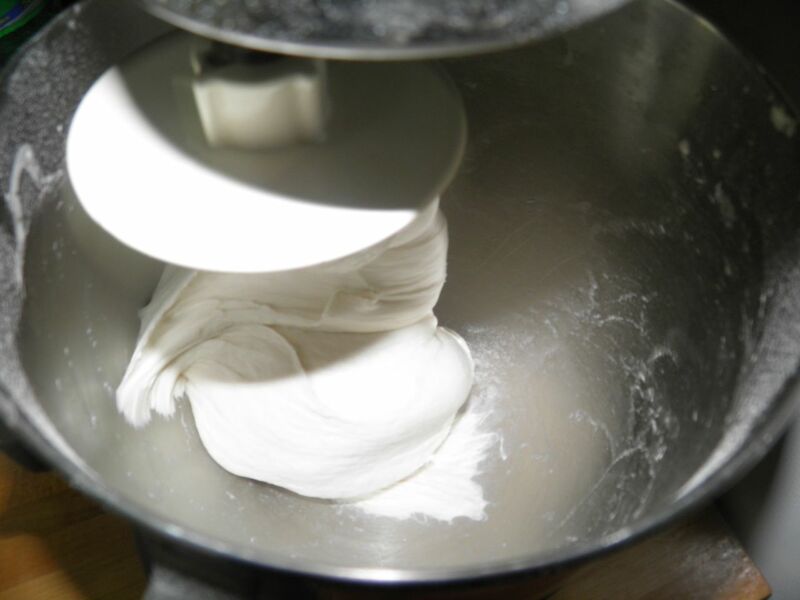 Scoop out the dough onto the work surface and cut it in two. Then place each piece on a cookie sheet that also has been liberally sprinkled with flour. Flour the tops. Let the loaves rest for 45 minutes. While they rest preheat the oven to 485°F. At the end of the 45 minutes gently stretch each piece into a 6x8 rectangle. Flip each piece over and flour the top again. Flipping redistributes the air holes. I flattened mine into a 10x12. It was too much. 6x8 will do nicely.